Presenting a detailed history and description of each production transmission to use a Simpson gearset is well beyond the scope of this article. However, we will explain the basic principles of its operation, which will help you understand the production applications and their relatively minor variations on the theme. 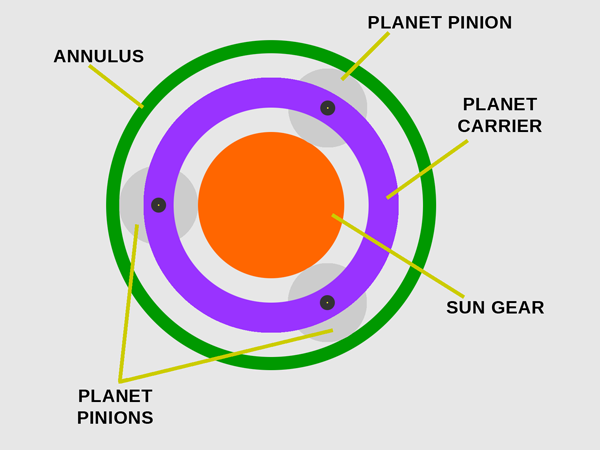 A simple planetary gearset has three elements: a sun gear, a set of planet pinions journaled on a planet carrier, and an annulus (ring gear). All the gears are in constant mesh: The planet gears mesh with the sun gear and the annulus meshes with the planets. Obviously, the planet carrier is not a gear; rather, it’s the armature holding the pins on which the planet gears rotate, which may itself rotate at a different speed than the planets, the sun gear, or the annulus. A Simpson gearset is a compound planetary gear train with five elements: the annulus of gearset A (which we’ll abbreviate AA); a set of planet pinions on the planet carrier of gearset A (which we’ll abbreviate CA); the sun gear (S); the annulus of gearset B (AB); and another set of planet pinions on the planet carrier of gearset B (CB). Annulus B is permanently affixed to the output shaft. A low/reverse brake that can hold planet carrier B stationary in certain gears. An intermediate brake that can hold the sun gear stationary in certain gears. We say “at least” because some transmissions use multiple brakes of different types, a point we’ll discuss in more detail below. 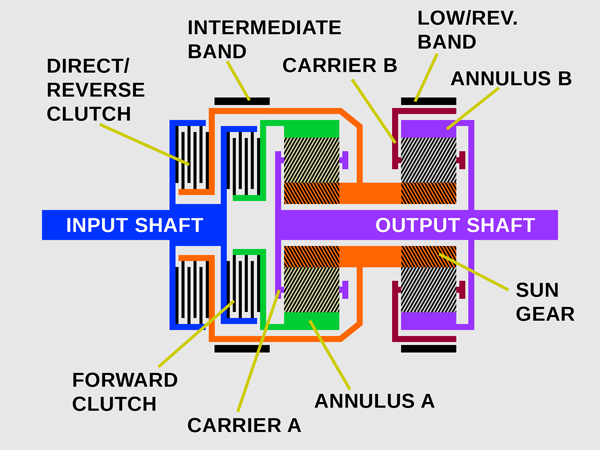 First (low): The forward clutch engages, allowing the transmission input shaft to drive annulus A (or connecting planet carrier A to the output shaft). A low/reverse brake is applied to planet carrier B. As annulus A rotates, reaction torque created by the inertia of carrier A causes the sun gear to turn backward. The sun gear’s reverse rotation attempts to turn planet carrier B backward as well, but the low/reverse brake holds the second carrier stationary instead. This causes annulus B to rotate around the stationary carrier in the opposite direction — which in this case is forward — at reduced speed. 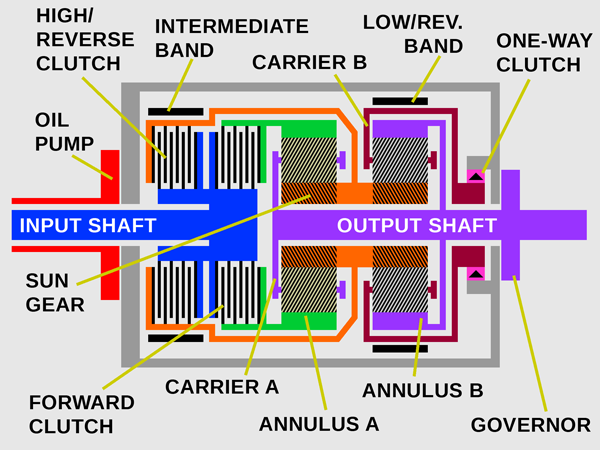 Since carrier A is also affixed to the output shaft, it must also rotate forward at the same speed. 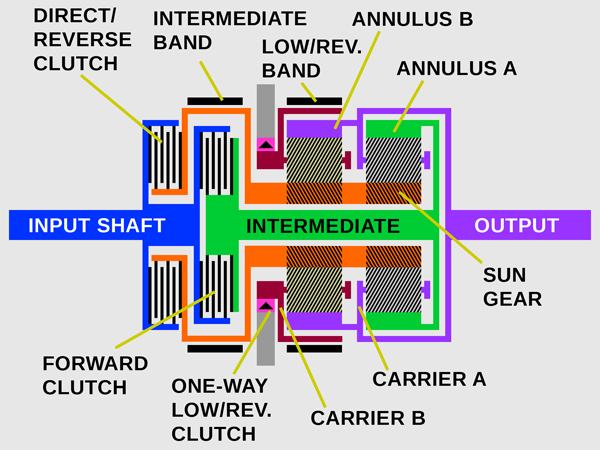 Second (intermediate): The forward clutch remains engaged, so the input shaft continues to drive annulus A forward. The low/reverse brake disengages, allowing planet carrier B to rotate freely. An intermediate brake is applied to hold the sun gear. As annulus A rotates, reaction torque attempts to turn the sun gear backward, but the brake holds the sun gear stationary instead. This forces planet carrier A — and the output shaft — to rotate forward around the now-fixed sun gear at reduced speed. 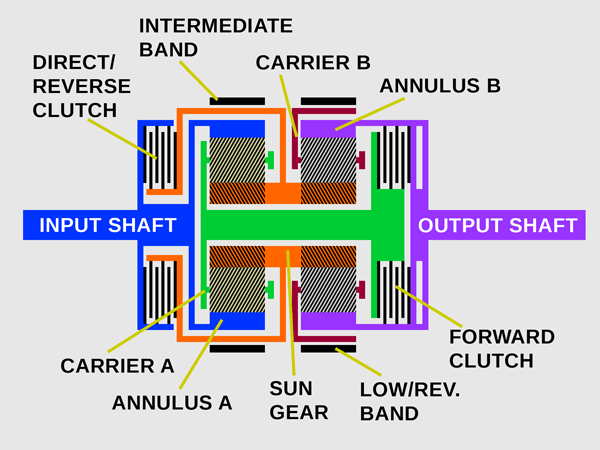 The rotation of the output shaft drives annulus B forward at the same speed, causing planet carrier B to rotate idly forward around the stationary sun gear. Neutral: All clutches and brakes are released. No element is connected to the input shaft (or the torus cover) and no element is held. In principle, a Simpson gearset can use any type of brake or clutch; Simpson’s earliest versions of this layout used cone and dog clutches along with band brakes. Most production applications use a mix of multi-disc clutches, band brakes, and one-way clutches. Unlike other types of brake, which keep the elements to which they’re attached from turning in either direction, a one-way clutch (or overrunning clutch) allows a gear element to rotate in one direction, but not the other. Many Simpson gear trains (and other automatic transmission layouts) use sprag-type or cam-and-roller one-way clutches to simplify the mechanics of shifting. For example, you’ll notice in the above summary that in first gear, the sun gear of a Simpson gearset rotates backward (i.e., opposite the direction of engine rotation and attempts to rotate planet carrier B backward as well. In second gear, carrier B rotates idly forward. 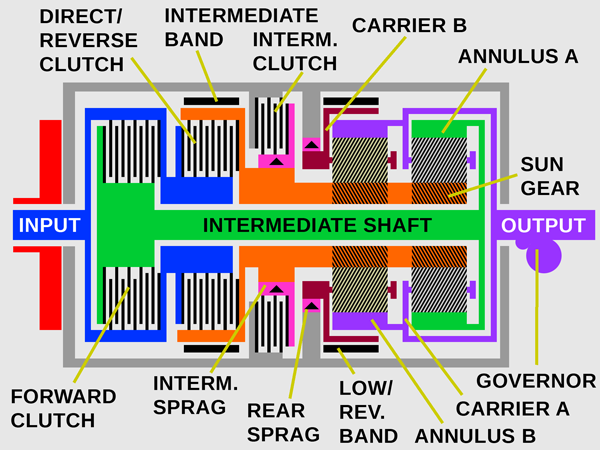 If carrier B is connected to a one-way clutch that allows it to turn forward but not backward, that clutch will hold carrier B stationary in first and automatically releases upon the shift to second, or vice versa. 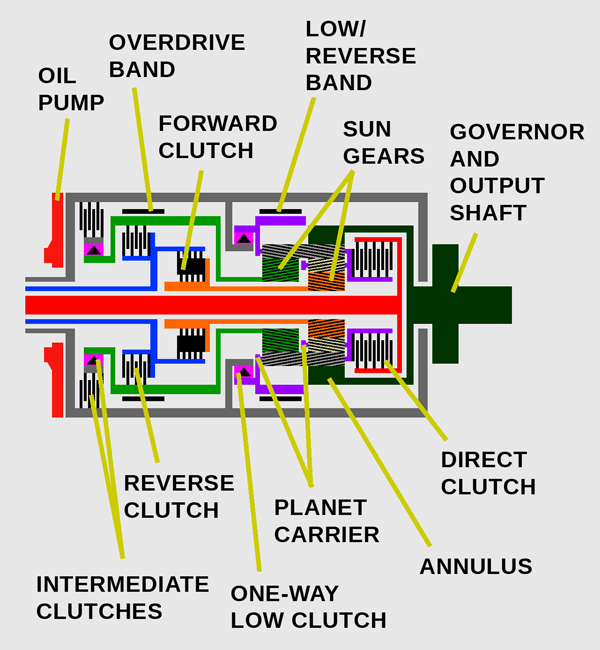 The one-way clutch requires no external mechanism or synchronization. Some transmissions with Simpson gearsets, such as Chrysler’s TorqueFlite, use both a one-way clutch and a separate brake for first gear, but only a single band- or clutch-type intermediate band for second. To use a one-way clutch to hold the sun gear in second, there must be some means of neutralizing that clutch in first gear, when the sun gear has to turn backward. Simpson proposed doing that by attaching the outer race of the one-way clutch to a brake drum and band brake. Reverse rotation of the sun gear would always lock the inner race against the outer race, but with the brake released, the whole drum would simply rotate backward. Some production transmissions, including GM’s Turbo Hydra-Matic, accomplished the same effect by using a multi-disc clutch to lock the one-way clutch’s outer race to the transmission case. As with a one-way clutch on carrier B, a separate overrun or coast brake is still needed to keep the sun gear locked when coasting. Turbo Hydra-Matic included an overrun band for this purpose, functional only when manually selecting a lower speed range and disengaged in Drive. This gave the driver greater ability to keep the transmission in second gear for engine braking in hilly terrain. While this arrangement is obviously more complex than a simple two-brake/two-clutch Simpson gearset, it allows each shift in Drive to be accomplished by engaging or disengaging one element. In a Turbo Hydra-Matic, for example, engaging the forward clutch from a neutral condition would give first gear; also engaging the intermediate clutch would give second; and engaging the forward, intermediate and direct/reverse clutch gave third. Downshifts were just as straightforward; from third, releasing the direct/reverse clutch would produce an immediate downshift to second and then releasing the intermediate clutch put the transmission back in first. The additional mechanical complexity was repaid with simpler (and usually smoother) shift action between all forward speeds. On the following page, we’ll explain how a Simpson gearset’s ratios are calculated. The ratio of any gear train depends on the relative velocities and numbers of teeth of the various gear elements. For two meshed gears, the ratio is the teeth of the driven gear divided by the teeth of the driving gear. For example, if a gear with 25 teeth drives a gear with 40 teeth, the gear ratio will be 40 ÷ 25, or 1.6:1, meaning that the driving gear must turn 1.6 times for each complete rotation of the driven gear. For the sake of brevity, we’ll abbreviate “sun gear teeth” as ST, “annulus A teeth” as AAT, and “annulus B teeth” as ABT. In a Simpson gearset, annulus B is always affixed to the output shaft. Therefore, the velocity of annulus B (which we can abbreviate VAB) must always equal VO. 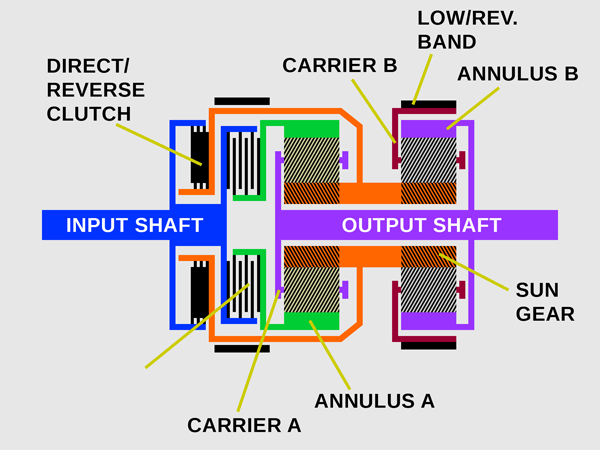 Typically, carrier A is also affixed to the output shaft or else affixed to annulus B. Either way, the velocity of carrier A (VCA) must also equal VO. 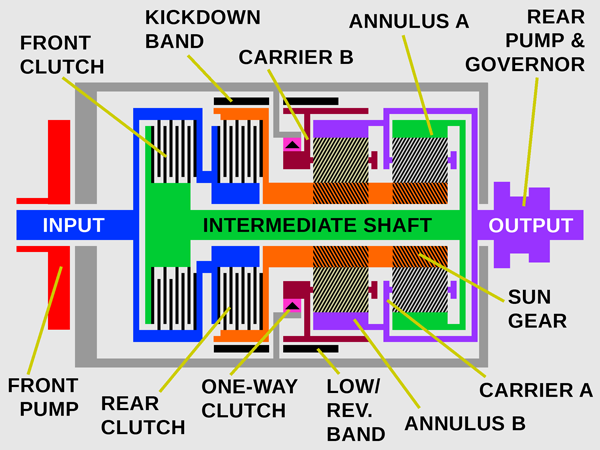 However, in variants where annulus A is permanently connected to the input shaft and carrier A is connected to the output shaft through the forward clutch, VCA only equals VO when the forward clutch is engaged. In any iteration of the Simpson gearset, both the forward clutch and the low/reverse brake(s) are engaged in first. Therefore, in first gear, the velocity of annulus A (which we’ll call VAA) equals VI and the velocity of carrier A (VCA) must equal the velocity of annulus B and the output shaft (VO). Since carrier B is held by a brake in first, the velocity of carrier B (VCB) equals 0. Note the negative sign, indicating a reversal of direction. Since the velocity of the input shaft is positive (forward), the sun gear’s velocity must be negative (backward). The sun gear’s velocity is already negative, so the two negative signs cancel each other out, making the velocity of annulus B positive. 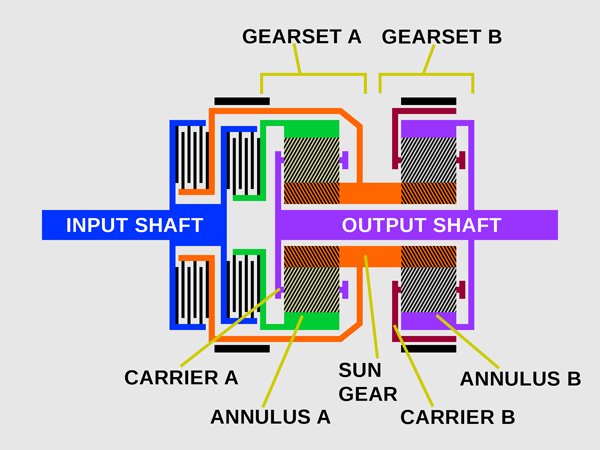 In other words, the sun gear’s backward rotation causes annulus B, carrier A, and the output shaft to rotate forward. In second gear, the forward clutch remains engaged, but the low/reverse brake releases and the intermediate brake engages, which brings the sun gear to a halt and prevents it from turning backward. Since annulus B rotates forward in second gear, VAB is a positive number. Therefore, VCB is also positive, meaning the rotation of annulus B attempts to rotate carrier B forward at reduced speed. If carrier B is held by a one-way clutch in first, the one-way clutch will allow carrier B to rotate idly forward. If carrier B is held instead by some other type of brake, that brake must be released for the shift to second. In third gear, the forward clutch remains engaged, but the intermediate brake is released and the direct/reverse clutch engages. Therefore, VCB also equals VI. 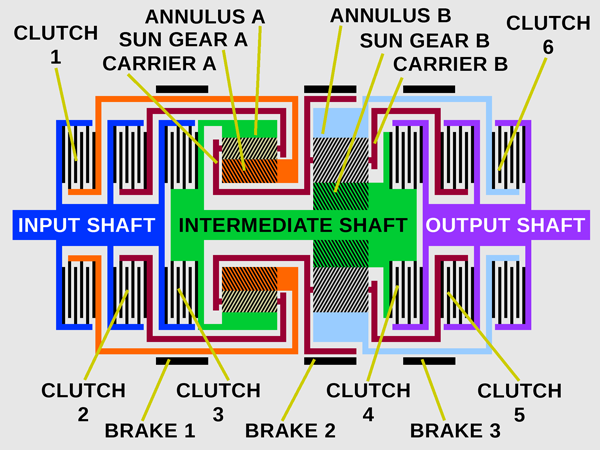 Since both carrier B and the sun gear each have a positive velocity (rotating forward), any one-way clutches attached to those elements will unlock and remain unlocked in third. The gear ratio in third is therefore 1:1 — direct drive. 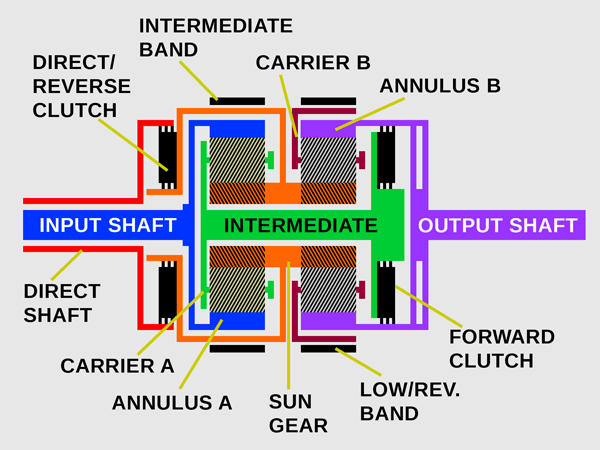 We could simplify this further, but we’ll spare you and just say that carrier B will rotate idly forward, turning somewhat slower than the sun gear, but faster than the output shaft. For reverse, the forward clutch releases and both the direct/high clutch and low/reverse brake engage. With the direct/high clutch engaged, the sun gear now rotates with the input shaft, so VS equals VI. As in first, carrier B is stationary, so VCB equals 0. Note the negative sign, indicating a reversal of direction. As in first gear, holding carrier B stationary while the sun gear turns causes annulus B to rotate in the opposite direction. Since the sun gear is rotating forward, annulus B must turn backward. 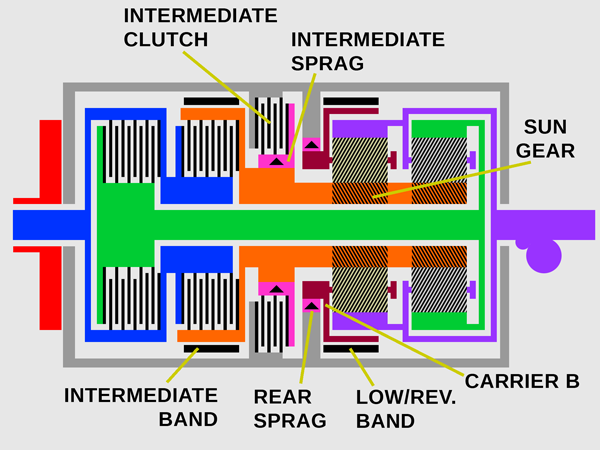 In reverse, the direct/reverse clutch is engaged, causing the sun gear (orange) to rotate forward at the velocity of the input shaft (medium blue). The low/reverse band is engaged, holding carrier B (dark red) stationary. This drives carrier A and annulus B backward. In Simpson gearset variants where annulus A is permanently connected to the input shaft, annulus A will naturally continue to rotate forward at a velocity equal to VI. However, the release of the forward clutch disconnects carrier A from the output shaft. Since VAA and VS both equal VI, just as in third gear, carrier A will rotate idly forward at input shaft speed. 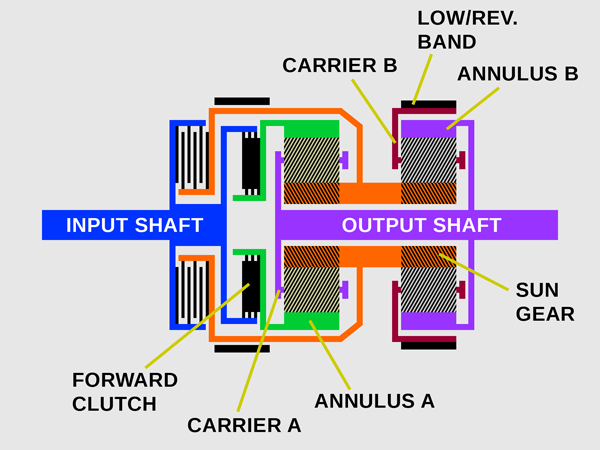 In variants where disengaging the forward clutch disconnects annulus A from the input shaft, carrier A will rotate at the same velocity as annulus B. In this case, that means carrier A rotates backward as the sun gear rotates forward. Annulus A resolves that difference by rotating idly backward at a velocity equal to VS * (ST² / AAT² – 2 * ST / AAT). Most Simpson gearsets achieve neutral by releasing all clutches and brakes. With none of the elements driving, no torque can be transmitted to the output shaft. 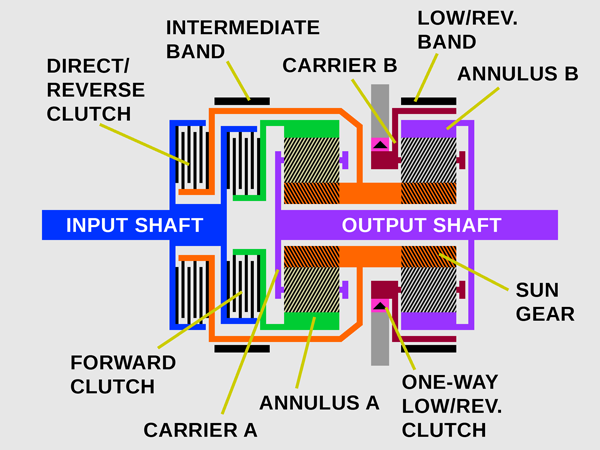 In variants where annulus A is permanently connected to the input shaft, the forward clutch is disengaged in neutral to disconnect carrier A from the output shaft. Gearset A therefore tends to rotate idly forward as a unit. 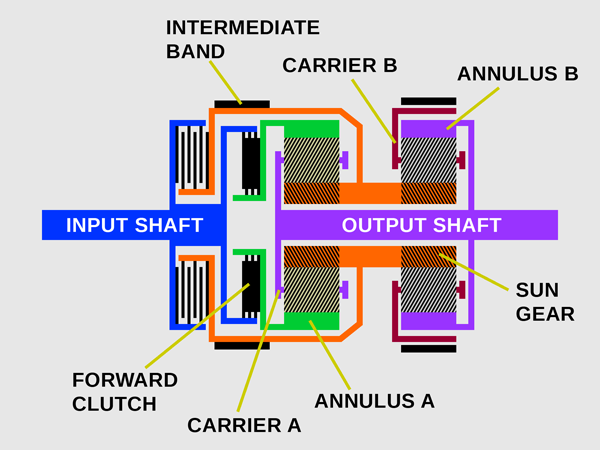 The rotation of the sun gear and the inertia of annulus B (which is connected to the mass of the output shaft) tend to rotate carrier B forward, so if there is a one-way clutch on carrier B, it remains unlocked, allowing carrier B to idle. We mentioned earlier in this article that it’s very common for both gearsets in production Simpson gear trains to use identical gears for reasons of production economy. In a Simpson gearset, if annulus A and annulus B have the same number of teeth, then ABT divided by AAT must obviously equal exactly 1. The gear ratio in first gear would therefore become 2 + ST / AAT. As you can see, that will always be the ratio in second gear plus 1. For example, early GM Turbo Hydra-Matic 400 (TH400) transmissions had a sun gear with 39 teeth, identical planet pinions with 21 teeth, and identical ring gears with 81 teeth each. Since 39 divided by 81 is 0.481, a TH400’s forward ratios are therefore 2.481, 1.481, and 1.000. Reverse is 81 divided by 39, or -2.077. We don’t have gear teeth counts for the early Chrysler TorqueFlite, but we would surmise it had a sun gear with 40 teeth, identical planets with 24 teeth, and identical ring gears with 88 teeth, which would yield the published ratios of 2.45, 1.45, 1.00, and -2.20. Ratios like these were well-suited to American V-8s or big six-cylinder engines, especially with a torque converter to provide extra multiplication under load. Even “tight” torque converter with a modest 2:1 stall ratio gave these transmissions a robust maximum starting ratio of almost 5:1. Second gear, meanwhile, provided a useful passing gear for typical U.S. highway speeds (45 to 75 mph, 72–121 km/h). However, gearing like this was less than ideal for smaller engines with less torque, which needed a shorter (higher numerical) first gear for decent acceleration off the line. A Simpson gearset with identical gears can’t get a first gear shorter than about 2.6:1 without using tiny planets on an enormous sun gear, and doing so makes second gear too short to be an effective highway passing gear. With these ratios, engine speed drops only 34.4% on the 1–2 shift and 28.6% on the 2–3. By comparison, the stock gears of a Turbo Hydra-Matic 400 give an rpm drop of 40.3% from first to second and 32.5% from second to third. However, such a tall first gear would make for sluggish launches unless accompanied by a very short axle ratio and/or a torque converter with a high numerical stall ratio. A gearset like this is therefore intended mostly for racing.